This WiFi serial transceiver module is based on the ESP8266 chipset. The ESP8266 modules offer a very cheap way to expand microcontroller projects with Internet connection. ESP8266 has an Integrated TCP/IP protocol stack. 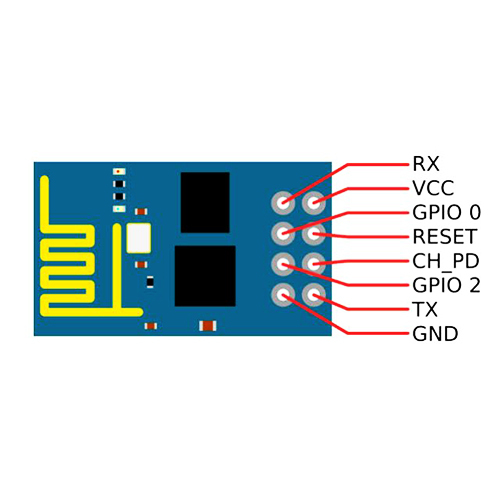 In short, the ESP8266 module is a TTL "Serial to Wireless Internet" device. The module runs at 3.3 Volt and the serial port is set to a data rate of 115200 baud. This is a video of How to easily and quickly program the ESP8266 module via an Arduino using the Arduino IDE with example. ESP-01 boards are still super cheap! If only they could fit nicely into a breadboard ... so you can built a little adapter out of a few spare header pins and hot glue. Enjoy!